There is no gainsaying that a good program to decode DVDs has a knack for playing DVD movies in a user-friendly environment without shortening DVDs' life span. You can simply rip and convert DVD into a format that is readable on your computer or mobile device with such kind of software, thus your cherished DVD collections can be preserved forever. However, the scarcity of DVD decoder for Mac OS ruins many Mac users' confidence in finding a qualified one. Contrapose the main existing issue, this article shares one superb DVD ripper for Mac with strong decoding ability on Mac OS. Don't be hesitate. Let's move on. Notice: We only advocate using this DVD decoding program under the concept of Fair Use and do not encourage any illegal reproduction or distribution of copyrighted content. Please abide by the local DVD copyright law before decoding any protected contents. To be frank, the software I recommend is called MacX DVD Ripper Pro. This exceptional Mac DVD decoder works on latest macOS Mojave and earlier, and delivers cinema-quality performance and 5x real-time converting speed to decode DVD movies protected with CSS, region code, RCE, Sony ArccOS, UOPs, Disney X-project protection and more, so that it will allow users to transcode the new DVD movies. With this DVD decrypter for Mac in hand, you can copy the main content of a DVD to hard drive on MacBook/MacBook Air/iMac etc, convert DVD to MP4, MOV, AVI, FLV, WMV, etc and convert DVD video for playback on media players and mobile devices such as iPhone, iPad Mini 4/Air 2/pro/mini 4, PS4, Samsung Galaxy S9, HTC 10, WP8, etc. Free download DVD decoder on Mac and run it, install and run it (you can also get the Windows version on PC). The interface of this software is based on a standard Mac with straightforward elements that are easily used by individuals of any experience level. Just click "DVD Disc" or "DVD Path" button to import the DVD movie you want to rip. Select the output format as you desire from the pop-down box. You can simply choose video format like MP4, M4V or MOV from Mac General Video, or select the specific device from the respective tab. Here we take ripping DVD to iPhone 6s as an example. Simply hit "Apple Device"->"to iPhone Video"->"iPhone 6s/Plus" as the output format and click "Done" button. Click "RUN" to start ripping DVD on your Mac computer. With this best DVD ripper and DVD decoder for Mac, you can also view the conversion progress and are able to cancel the converting process at anytime. After the you transcode the DVD into digital formats like MP4, MOV, FLV, AVI or others, you can store them on computer and play with video players, or move them to mobiles to watch on the go. For the latter case, you need to use iTunes to transfer DVD movies to iPhone iPad mobile devices, which is quite complicated. 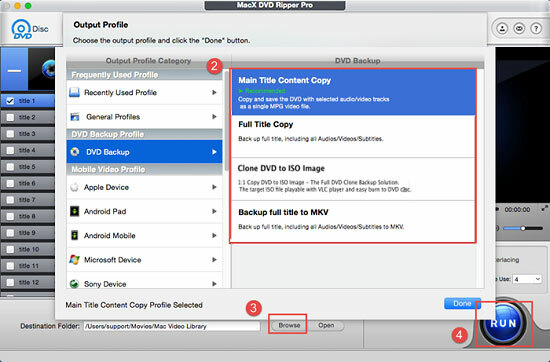 Now MacX MediaTrans can save you from those inconveniences by transferring DVD movies from Mac (macOS Mojave etc) to iPhone iPad iPod on iOS 12 with simply one or two clicks. Even though your DVD movies are decoded into MKV AVI FLV VOB, this versatile DVD movie transfer can still successfully sync DVD movies to iOS devices by automatically converting the video formats.